And we gave all our money but our subway fares. It seems almost an anomaly to do a close reading of a poem that seems to not withhold anything in its meaning. Millay tells us that the poem entails–its frame if you will–an all night ferry ride, to and fro, of two companions, ending with the two giving away their previously purchased fruit to a woman either on the ferry or on shore at ride end in the early morning, saving for themselves only their subway fare. Presumably, this is a poem that captures the frenzied excitement of two lovers, for whom time together, even in a humble setting and with little money (they had bought fruit), is what matters. Millay’s lover-friend, Floyd Dell, one of many, tells us in a 1959 letter that Millay had done the ride with Nicaraguan poet Salomón de la Selva, later affirmed that year by Millay’s sister, Norma, who offered the poem’s Spanish title, “Recuerdo” (i.e., “I Remember”), as evidence. (De la Selva is a lover Milford misses in her biography of Millay (Savage Beauty 2001). Famously, the poem’s initial two lines, “We were very tired, we were very merry,/We had gone back and forth all night on the ferry” repeat themselves at the beginning of each stanza. Intriguingly, we anticipate a “but” to set up the contrast between the states of fatigue and exuberance, but it doesn’t occur, adding complication, perhaps suggesting the fervency of their passion. The omission could also imply a fatigue leading to silliness. In their repetition, Millay ensures her readers’ focus on the activities themselves, separately depicted in each stanza: looking into a fire, leaning across a table; lying on a hilltop underneath the moon (stanza 1); eating fruit (stanza 2); buying a morning newspaper, hailing a mother, her head “shawl covered,” to whom they give their remaining fruit (stanza 3). The mother appellation suggests the lovers’ own freedom from the encumbrances of marital. love. As such, this is a poem intrinsic to the Greenwich Village bohemianism of that era. As such, it reflects the poem’s latent contrast between their practiced frugality and the plenitude of their love, reinforced at poem end in their giving their fruit away.The poem haunts with its rhythms–hexameter lines replete with feminine and masculine rhymes along with occasional near rhymes, alliteration and assonance, coalescing into a sensuous ambience. Redolent with the nuances of memory, the poem sparkles with the effulgence of new love and idealization of a day that endures because of it. And like Whitman, the poem sanctifies the individuality of everyday experience. Despite the denigration of Modernists, the poem’s fundamental strength lies in its very simplicity, affording accessibility and enjoyment. 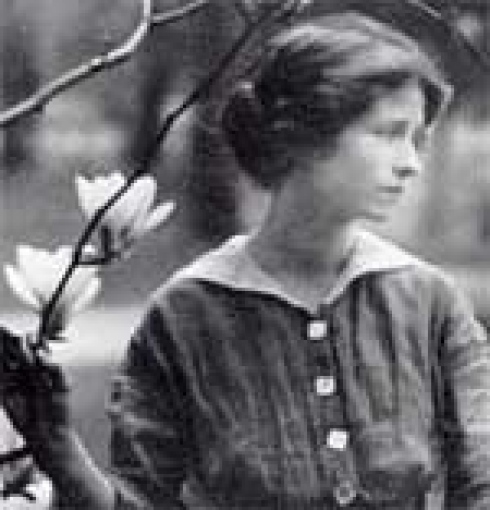 This entry was posted in Poetry and tagged American poetry, Edna St. Vincent Millay, Nancy Milford, Poetry, Recuerdo. Bookmark the permalink. Thank you for writing about this. I just studied this in my Stanford poetry class online – Ten Premodern Poems by Women. Great post!